Favorite Quote: "And thats an order!" One of the all-time greats in the World Wrestling Federation, Sgt. Slaughter holds the distinct honor of being both a former Federation Champion and a one-time commissioner! The former drill sergeant from Parris Island, South Carolina, remains active with the Federation as a backstage official. Sarges career in the WWF began in the early 1980s, as he battled rivals such as the Iron Sheik. But his American patriotism quickly did an about-face, as the iron-chinned superstar became an Iraqi sympathizer during the Gulf War in 1991. After forming an alliance with General Adnan, Slaughter pulled off one of the greatest upsets in Federation history by pinning the Ultimate Warrior for the Federation Championship at the 1991 Royal Rumble! After dropping the title to Hulk Hogan at WrestleMania VII, Slaughter took several months off to rethink his philosophy. He returned waving the American flag once again, and formed a popular tag team with fellow patriot "Hacksaw" Jim Duggan in 1992. 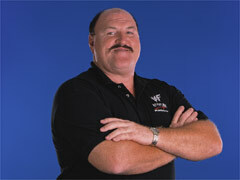 In mid-1997, Slaughter made his grand return on RAW, as he was named Federation Commissioner! After a tumultuous reign, the legend assumed a role as a backstage official late last year. He remains one of the greatest legends in Federation history!